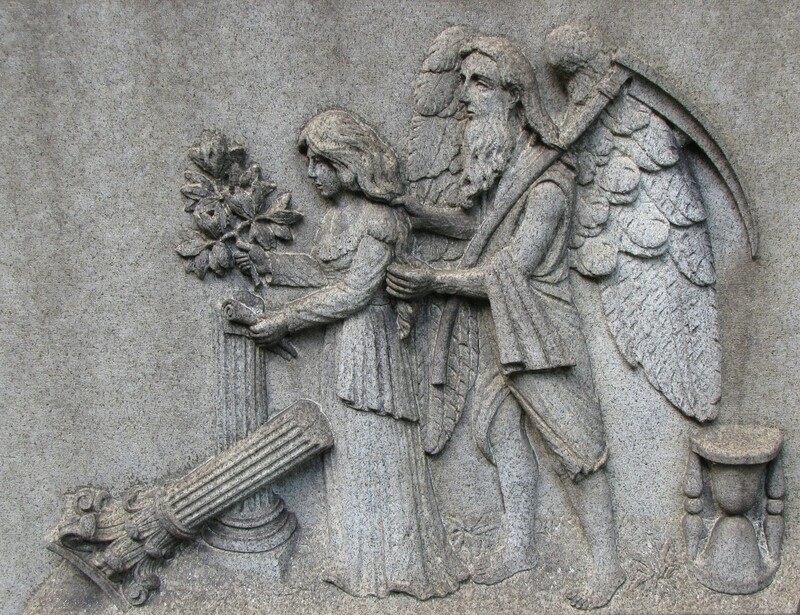 In this bas-relief, a winged Father Time is depicted here as an old man, with long hair and a long beard, with a large pair of wings. Father Time is plying the tools of his trade that make him recognizable–a scythe, he carries over his shoulder and an hourglass resting behind him. The scythe, a tool that was once used in the harvest, symbolizes the Divine harvest. The hourglass is a reminder that time marches on and as the sands of time pass by all come closer to death; life is short. Just as wheat is cut down by the scythe during the harvest, so are souls by Father Time. Here, Father Time is standing behind a “weeping virgin”. Father Time is delicately untangling the Virgin’s hair. The act of untangling represents that with perserverance all things can be accomplished. The weeping woman is holding in one hand a sprig of acacia, which represents the immortality of the soul, and in the other a rolled scroll, symbolic of life and time. They stand before a broken column, the symbol of a life cut short.